It’s officially acceptable to start talking about Christmas! 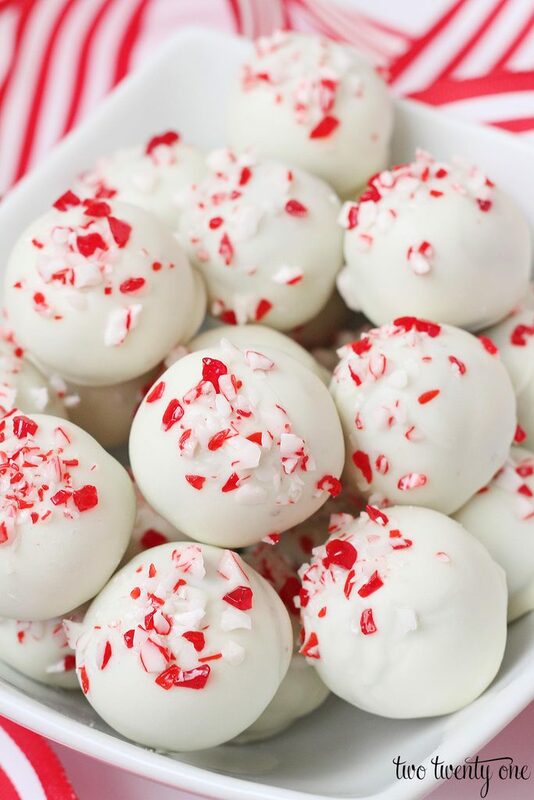 To celebrate this momentous annual occasion, I’m sharing these Peppermint Oreo Truffles, which are the perfect holiday treat. Now, they may look intimidating because they’re an attractive dessert, but they’re really simple to make. And there’s the added bonus of only needing 4 ingredients. 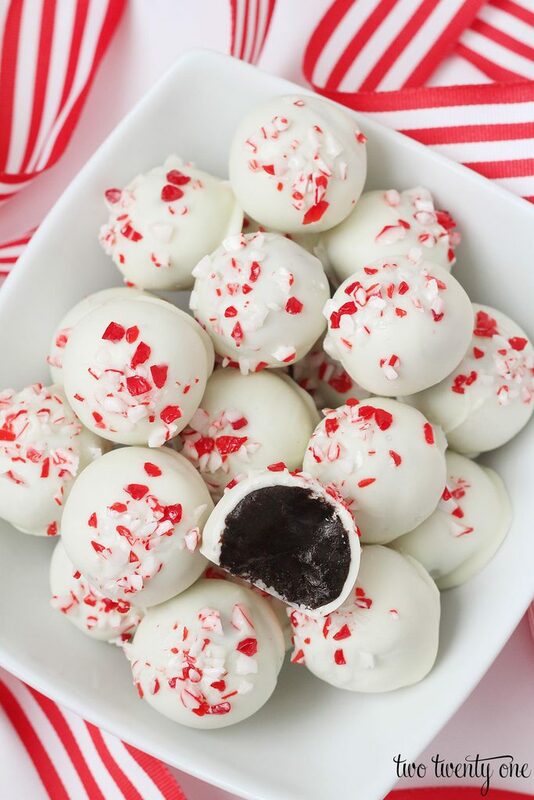 A trick to making the perfect peppermint Oreo truffles, is this gadget. It’s one of my top ten kitchen utensils. So put one on your Christmas list stat. Crush the Oreos WHOLE. Do not sit in your kitchen and scrape the white Oreo filling from each cookie. To be honest, that sounds like some form of torture. I used vanilla almond bark for the coating. But you can use whatever you want, whether that be almond bark, candy melts, or melting chocolate. Just get at least 8 ounces because that’s exactly how much I needed. For the crushed candy cane topping, I usually put candy canes in a ziploc bag and crush the candy canes with the bottom of a glass. But as I was strolling through Michael’s, I came across a bag of Candy Cane Crunch. I had a 50% off coupon (I think it was $3-4) so I threw a bag in my cart. So if you don’t want to spend time crushing candy canes, head to Michael’s and grab a bag of this stuff. To keep the white chocolate white, refrigerate the truffles for at least one hour. Then, melt a little bit of chocolate at a time, dip the truffles, and repeat. As a result, the chocolate won’t get as dingy-looking from the dark truffles. One of the things I love about this recipe is that these can be made a day or two in advance. Just keep them in the fridge until you’re ready to serve them. Similarly, if you’re a peppermint lover like like me, be sure to check out my peppermint pattie brownies, peppermint chocolate cookies, and chocolate peppermint sandwich cookies. I’ve been thinking about making these for Christmas. Would it work to use peppermint Oreos instead of the peppermint extract? Thanks!! You could but you’d have to adjust the amount of cream cheese because the peppermint Oreos are sold in a smaller package so there’s less Oreos. Ah, ok. Good to know. Thanks!! yes. that is the way i have been making them for years. it in half and rolled the ball around it. a surprise inside! it has been a hit! frosting tinted green over it to know which are the mint ones. i just dumped the whole package of mint oreos in and put about a tablespoon less cream cheese. Do you think these would freeze well? I like to make treats ahead so I can just pull them out, we have family in town for over a week through the holidays! Sure! Let me know how they turned out! Can you tell me what kind of chocolate you used because the oreo balls did not turn out that perfect. Also, the chocolate from the mix mixed with the white chocolate.. I used vanilla candy coat. Yeah, the darker chocolate from the Oreo mixture will start to mix with the white chocolate/candy coat. I usually melt small batches to try to prevent that from happening. How do you dip the ball in the chocolate and remove it without the chocolate going everywhere? I have made these in the past and they do not turn out pretty at all!! I have made these many times, and they are always a hit. They freeze extremely well, so make a huge batch and keep them on hand–great hostess gift. At our house, they last until my sons realize they are in the freezer, then they seem to disappear immediately! I’m printing and pinning these. I just know this will be a hit with our family for Christmas Eve! Thank you for sharing. I can’t believe it takes so little to make these gorgeous treats. I’ll definitely have to give this a try when the kids aren’t home since they’ll eat all the Oreo cookies. Pinned. I make these every year and I can NEVER get the chocolate coating to work out. How did you dip them so perfectly? I have tried every trick I can find and they still look like jagged chocolate balls! This year I made regular Oreo balls and added caramel to some of them (awesome! ), made peanut butter version with peanut butter Oreos, and I used the peppermint Oreos for some as well. Those turned out really good too! These are always my favorite and I have a hard time sharing them! I used the same technique for the Oreo truffles. Those sound delicious! I’ll have to try those combos! These look fantastic! Planning on making them for our Christmas Eve party. Do I need to add the cookies into the cream cheese and peppermint mixture before refrigerating? A little confused on how everything gets combined otherwise. Thanks! Thanks, Heather! Crush Oreos to fine crumbs; place in medium bowl. Add the cream cheese and peppermint extract to the bowl; mix until well blended. Refrigerate the mixture until firm. Hi Chelsea, do you use the full Oreo including cream filling or just the cookie part? Yes I have the same question too! 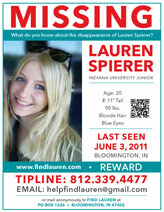 Can anyone share ASAP? I’d like to make these tonight if possible. Hehe, no. That would be quite time consuming. And I’m not about that action. Thanks so much! Making them now. I was impatient and went ahead and just put the whole Oreo package in my Ninja ?. 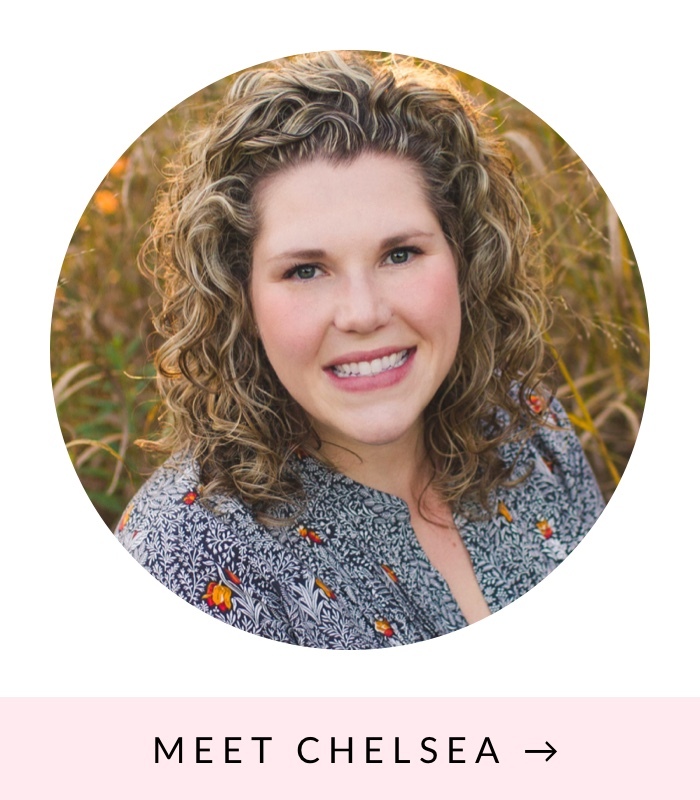 Thanks so much, Chelsea! I used the whole thing.. cookie and filling. Do you mix these with a mixer or by hand? I prefer my KitchenAid mixer because it’s easier. You can get a much smoother coating if you thin the almond bark with a small amount of Crisco, ladies. It also helps if you dip the ball on the end of a fork and tap off the excess, letting it drip through the tines. I have made these for years in a multitude of flavors. I’ve done coffee flavored, cinnamon king cake(it’s a New Orleans thing), peanut butter chocolate, double chocolate, mint choc, the peppermint choc, and a bunch of others. Once you start making these, your friends and family will beg for them and you won’t be able to stop! How much Crisco did you use to thin the almond bark? How did u melt the chocolate? Most people use microwaves these days but I don’t own one. Would just in a sauce pan work? I usually create a double boiler and melt the chocolate in a metal bowl over a saucepan of boiling water. But you can melt it in a saucepan. You could, but it may chop up the Oreos too much. About how many does this recipe makes? Excited to make these this week! How long do they last? I’m hoping to make them this week and give them out (as part of my annual cookie tray gifts) the following week. Will they last 2 weeks if I keep them in my fridge while I have them? I honestly have no clue. They never last that long around here because they get eaten rather quickly. I think 2 weeks is a stretch though. you can pop them in the freezer to keep them for longer periods of time. then dip them a day ahead when you are ready to use them. i would suggest putting them on a cookie tray and freezing them. when frozen, take off of tray and store in a zip lock container or bag. but keep them from getting squished by other items in your freezer if you use a bag. I used the Wilton Candy melts to dip and it was way too thick – how do you get a thin finish? How much Crisco to add? Go a tiny bit at a time. If you add too much the chocolate won’t set. I’m sorry, but the recipe says 1.16 oz of oreos, 11,6 oz or 116 oz? The recipe states 1 16 oz. package regular Oreo cookies. These taste so good! Just made a batch as a ‘practice run’ before I make them for Christmas. My family couldn’t get enough. However, I somehow managed to run out of chocolate way before I was finished coating all of the balls, and I had a hard time getting them out of the melted chocolate without ruining how pretty they looked lol but overall, amazing! I was having a hard time mixing the Oreos and the cream cheese so I put a little bit of milk in there to help mix, works pretty good, but I’m not sure if my mixture is too sticky! Can I use white chocolate chips for the coating shell? Do you have to keep them cool to hold up? Was going to give as gifts. And kinda worried that the people I give them to won’t know to keep them in the fridge.